A Toyota driver nearly caused a crash while on the M18 near Doncaster after they undertook a lorry on the hard shoulder before slamming on the brakes. Captured on a dash cam mounted to a lorry, the footage sees a red Toyota fly up the hard shoulder, undertaking a truck on the inside lane. After making the move, the driver then makes the decision to pull into the outside lane and slam on their brakes in front of the camera truck. Brian Dukes, who is driving the camera lorry, is forced to slam on his brakes and narrowly avoids rear-ending the Toyota. 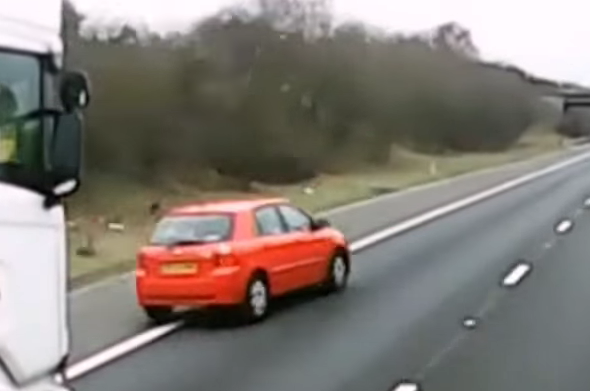 Dukes told the Daily Mail: "Idiot couldn't wait for the truck to overtake so drove down the off slip.. across the chevrons and onto the hard shoulder to undertake just so he could do this." Some have pointed out that it can be frustrating to be stuck behind a lorry overtaking another truck, but it doesn't excuse this dangerous behaviour. Please note that the driver has confirmed that the date and time displayed on the clock are incorrect.